Patrict Page makes the transition with makeup, wigs and costumes into a bitter small-hearted Grinch that tries to steal Christmas from the residents of Whoville in Dr. Seuss' "How the Grinch Stole Christmas" on Broadway at the St. James Theatre through Jan. 6. Photos courtesy of Every Thing GoesOwned by Staten Island's cooperative community Ganas, and packed with used books, records, doodads and a seemingly endless list of different kinds of fair trade tea, ETG is a place that has intrigued residents of the North Shore and beyond with its wares since it opened its doors almost two years ago. It doesn't take long to figure out that the Every Thing Goes Book Cafe is about the vibe. Right when you walk in the door, one of the first things that meets the eye is a cloud-shaped sign, hanging from the ceiling, reading "Imagine The World You Want." "Steve made that sign, and I think it really represents what we're trying to do, which is build a positive place open to everyone," says Katie McCarthy, 49, who co-manages the ETG Book Cafe with Steve Jones Daughs. Owned by Staten Island's cooperative community Ganas, and packed with used books, records, doodads and a seemingly endless list of different kinds of fair trade tea, ETG is a place that has intrigued residents of the North Shore and beyond with its wares since it opened its doors almost two years ago. Whether they come for the three Internet-connected computers, the kids' books, the coffee or just a nook where one can listen to records and read to their heart's content, there's a steady stream of folks going through the cafe. "Our mission is to help people present themselves or perform in whatever way they want to," says Steve Jones Daughs, 50, of St. George. "And our goal is to present them well." But the longer they're around, Jones Daughs and McCarthy's keen abilities for making ETG cozy enough for the most Feng Shui hippie or yuppie is also drawing an increasingly diverse nighttime schedule of performers and presenters. "Our mission is to help people present themselves or perform in whatever way they want to," says Jones Daughs, 50, of St. George. "And our goal is to present them well." Along with a small raised stage and well-placed sound system, Jones Daughs has set up two projectors, so presenters or musicians can play images or video of all kinds while they do their thing. One of the most successful shows of the past year was an appearance from Manhattan's Reverend Billy and the Church of Stop Shopping, a gospel-singing performance group that decries materialism and consumerism with their melodious activism. The small place was reportedly bursting at the seams. But it wasn't a big score for Jones Daughs, who does the booking. "They called us, and asked to come over and perform," he says. "We said, 'Sure, but it's kind of small' but they didn't seem to care. They came and packed the place. We do very little in terms of booking, because people hear about us and reach out to us first." Don't worry, it's not all Luddites and granola-eaters -- ETG's schedule is packed with the kind of evening programming that would pique the interest of almost anyone. From Island-centric folkies like Trish and Christoph, to nationally-touring musical acts, to multi-media presentations on the history of robots with A.I. demonstrations, avant- garde jazz and art shows, and on, Every Thing Goes seems to live up to its brand name. There are a few rules, though. McCarthy, whose Dewey Decimal-like knowledge and library skills keep the place afloat with used book and record sales, points out that X-rated or racist stuff doesn't fly. "We try to say yes whenever we can, but we also want to be a place where everyone is comfortable," McCarthy says. 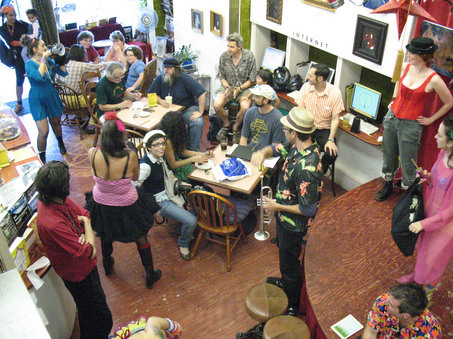 The cafe hosts a kids open mic at the end of each month. It starts in the afternoon and segues into an evening open mic for adults, just another proof that the cafe caters to all kinds of visitors. Ted Wisniewski, 40, of West Brighton, wrote most of his dissertation on psychology and the '60s counter culture in the shop. Robert Civello, 64, an artist who lives at Bay Street Landing, says that ETG is the place where he comes when he needs a break from painting. "It's a cut above your average coffee shop, for sure," says the painter. "I like the artist forums, where people can bring in slides and talk about their work, but the evening music programming is great as well, mostly because of the variety. This is a BTV, or before TV type of place, where you can actually strike up a conversation with somebody. It's great for people of this community." The cafe has long been a gallery space as well, offering local artists to curate the front of the space and kid artists to decorate the children's book area, where a bucket filled with little blue figurines says, "One Free Smurf." Winding their way back, a person will find that the Cafe opens up even more with chairs and record bins decorated with covers of classics like The Cars' "Candy-O." The back deck has been slowly expanded by the cafe's managing duo, and now there's enough space to host groups who want to play music or do other organized activities. "We just keep working on it, slowly but surely," says McCarthy. Contact AWE music writer Ben Johnson at bjohnson@siadvance.com. 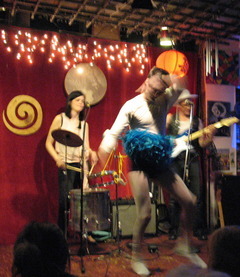 With the help of managers Steve Jones Daughs and Katie McCarthy, the ETG Book Cafe has come into its own, with an expanded space for visitors, Internet, a large selection of used books, CDs and records, and a schedule of diverse evening programming that makes it a viable nighttime spot. Check the online schedule at etgstores.com/bookcafe for a list of upcoming events.